Does a theory of the self require a theory of the body? If so, why? How might the systematic theorizing of an embodied self alter our understanding of subjectivity and social processes? This book is an account of how eighteen young women in a Mexican convent engaged in certain bodily practices with the explicit aim of reshaping their subjective experiences along a particular line of development. As such, it is a grounded engagement with current debates regarding embodiment and experience. But it is also an exploration of the ways in which gendered subjectivities may become politically and socially charged as a means of articulating cultural conflicts about modernity and how these larger meanings take on significance for people on the most intimately personal levels. Fundamentally, then, this book addresses the question of how we create meaning in our lives through embodied practice. I approach these issues within the context of a Roman Catholic convent in Puebla de los Angeles, Mexico, a highly elaborated domain for the production of embodied self-knowledge. At 4:45 the Grand Silence is compromised as eighteen sleepy young nuns tumble from their beds to recite the rising prayer in the cold darkness of the convent dormitory: "I pray, Lord, that you accept all my works, my thoughts, my emotions, and my desires as reparation for the many sins that will be committed today in this world...." In the echoing silence following the prayer, thirty-six bare feet pad across the cold stone floor toward the showers. Arms and legs are scrubbed, faces washed, and teeth brushed in preparation for morning prayers. Hospital-like curtains are pulled around the small beds, and shadows play behind them as the young women slip on the various layers of the blue postulant uniform over white cotton undergarments and arrange delicate black veils carefully over their still-damp hair. In the cool, predawn blackness the young women file out of the dormitory, down two flights of stairs, across the patio, through a hallway, and into the chapel, where they will remain in concentrated meditation for the next two hours. Another day has begun for the postulants of "the Siervas," a shorthand for the congregation's official name.1 Unlike cloistered orders, which are devoted to prayer and contemplation, active-life orders like the Siervas view it as their mission to labor tirelessly and selflessly in the service of others, particularly those on the margins of society: the poor, the forgotten, the fallen souls. Every moment of every day the nuns mortify their bodies and their souls, their sacrifice a powerful force in the salvation of the world. They strive to become living testimonies of Christ's immeasurable love, and they hope that as His2 brides, each will serve as a humble exemplar of how to be a woman in a world gone mad. For many in Mexico today the world seems, indeed, to have gone mad. It is a world where politicians funnel eighty-four million dollars from the national coffers into Swiss bank accounts, where protesters sew their mouths closed with black nylon string in politically motivated hunger strikes, where students take to the streets in angry riots, and where policemen slaughter dozens of campesinos and hide their bodies in shallow graves. Divorces and homicides are up, literacy rates and education are down, and many young people seem more engaged with what's happening on Friends than in their own backyards. What might motivate a young Mexican woman to become a nun at a time when a modernizing Mexico offers her so many new and exciting opportunities not open to women only a generation ago? What might a young woman's feeling of religious vocation tell us about changing constructions of womanhood and femininity in the wake of these social transformations? And what might account for the startling revival of interest in this particular congregation? 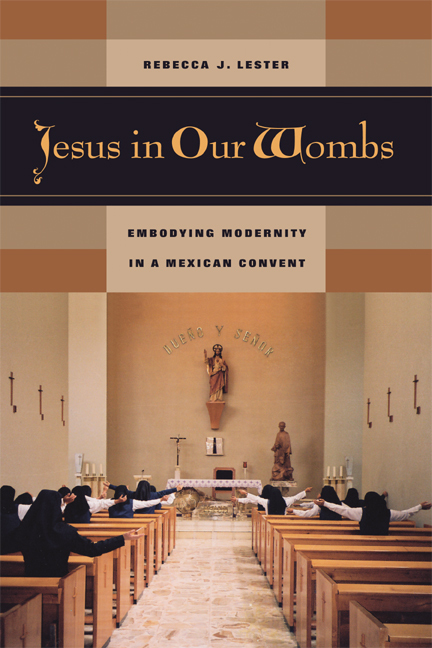 In Jesus in Our Wombs, Rebecca J. Lester takes us behind the walls of a Roman Catholic convent in central Mexico to explore the lives, training, and experiences of a group of postulants—young women in the first stage of religious training as nuns. Lester, who conducted eighteen months of fieldwork in the convent, provides a rich ethnography of these young women's journeys as they wrestle with doubts, fears, ambitions, and setbacks in their struggle to follow what they believe to be the will of God. Gracefully written, finely textured, and theoretically rigorous, this book considers how these aspiring nuns learn to experience God by cultivating an altered experience of their own female bodies, a transformation they view as a political stance against modernity. Lester explains that the Postulants work toward what they see as an "authentic" femininity—one that has been eclipsed by the values of modern society. The outcome of this process has political as well as personal consequences. The Sisters learn to understand their very intimate experiences of "the Call"—and their choices in answering it—as politically relevant declarations of self. Readers become intimately acquainted with the personalities, family backgrounds, friendships, and aspirations of the Postulants as Lester relates the practices and experiences of their daily lives. Combining compassionate, engaged ethnography with an incisive and provocative theoretical analysis of embodied selves, Jesus in Our Wombs delivers a profound analysis of what Lester calls the convent's "technology of embodiment" on multiple levels—from the phenomenological to the political. Rebecca J. Lester is Assistant Professor of Anthropology at Washington University.